Not much, but a place to support you on your travels to somewhere else nearby. Mostly we have the basics of everyday life in any place USA. Now allow us to share what we do have to offer that you might find unique to Yucca Valley. Yucca Valley is a water free area; there are no lakes, rivers or streams. 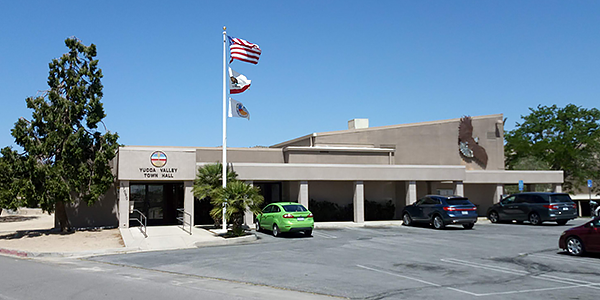 Whether you are a visitor or a new resident to Yucca Valley we would start our journey by learning about the town and the surrounding communities at the California Welcome Center Yucca Valley, and also talk with a few friendly and knowledgeable locals. There are regional artist’s works on display mostly in the old down town of Yucca Valley a location covering both the north and south sides of State Route 62 beginning in the east at Kickapoo Trail end of town and heading west from there to just after Church Street. We have a lot of churches in Yucca Valley. Just as an artist side note, at Active Atom our products are designs created through artistic skills and mechanical knowledge built 100% in Yucca Valley and made with the finest aerospace materials, we feel our works are artwork. While our American Made artistic products are precision machined on our CNC and micromachining equipment the finishes, plating or coatings, assembly and packaging our work is all done by us and by hand. Visit an old Drive-In Movie Theatre. We have the Sky Village Open Air Market on the dirt grounds of the old drive-in theatre and this is only open on weekends and it is free for the public to enter. There is a really cool little modernism building that you can take a great keep sake picture in front of. There are several other interesting items worth the stop at the Sky Village Open Air Market and you only need to park and walk into this large fenced venue that runs right along side the Yucca Wash, a wash that allows the rainwater to run east through and out of our town to begin your own exploration. The drive-in theatre has many old machines seemingly rusting away in the open desert, but they are a theme and they represent an earlier era of machinery vehicles and wagon transportation that used to populate this open desert area. There is the hand made crystal cave a giant white roster or chicken to see take a picture with or of. What we really suggest you do is to do what Lance and Patrick did shortly after our arrival into the Morongo Basin. We want you to stop at the vendor booths that open every Saturday 6:00 AM until 2:00 PM and Sunday 7:00 AM until 2:00 PM to beautiful blue sky’s in the early morning and talk to these generally long time residents of the Yucca Valley area, their stories and the excitement they convey are really an informative way to begin to learn and understand what makes this southwestern corner of the high desert community unique and interesting. The Golf Course Estates it is open to the public for a fee. Hawk’s Landing is located in the northwest end of the town. Play 6 holes or 12 add 6 more, make it a day and complete your full 18 hole, a round of golf. Maybe the fanciest place to eat in the Yucca Valley area is the Hawk’s Landing Country Club, inside where the who’s who of Yucca Valley wine and dine often. Lance and Patrick have never been inside. Motocross, endurance, off road trucks, rails, buggies home made off road creations ATV, riding is hot here, as you might not be aware Yucca Valley has more dirt roads then paved roads and there is a lot of places to enjoy off road challenges, though truthfully you would want to head out of the Town of Yucca Valley up State Route 247 north up through the pass out about 15 to 20 miles on the east side of the highway for the best off road challenges since that area is where there is an annual rock climb and open desert race course area named Landers and Johnson Valley. 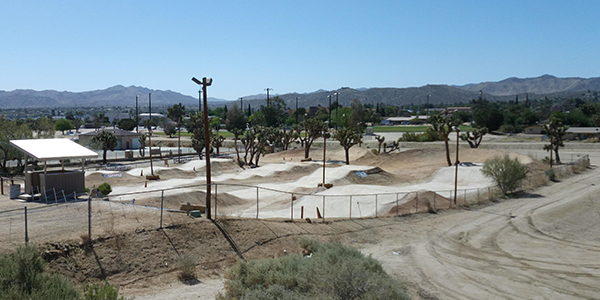 We have a skateboard park, ball field and a really family orientated BMX track (private open for events) that local residents are always enjoying. Located in the park next to the Town Hall Yucca Valley. We have a fireworks display July 4th annually in the heart of the downtown area Brehn Park on Little League Drive. Concerts in the park softball field next to the community center and City Hall are also held at the mid July through mid August, Saturday nights only. This park and these events are only two and a half blocks from our Yucca Valley home and work, we can hear the summer night’s music and watch the annual fireworks display right from our yard, it is truly great to be a part of these events. Star gazing is one easy thing to do especially since you are likely going to be outside during the evenings since the weather is generally great most of the summer and some of the other 3 seasons. The moon is an important member of Lance and Patrick’s lives. The moon many call a dead rock is critical to earth’s existence. The moon is far from dead, it has a solid heated core and a liquid outer core a thick mantle and a crust. The lunar surface reflects light onto the earth surface at night and it is our second brightest neighbor after the sun, but it is our closest neighbor 384,482 average miles from earth though it does get closer from time to time coming in at 238,855 miles from earth. Yucca Valley and the Morongo Basin experience minimal light pollution so viewing the moon stars suns and the many man made satellites and the occasional space station fly by make for a great experience, especially if you are from a high population brightly lit city. In the rural setting like we are living in means the moon provides very bright ground lighting for us and when the moon is full or we are experiencing a super moon you almost want a pair of sun glasses at night (just kidding). The surface of the moon is so clear to view at noght when it is utilizing the suns reflection you just want to lay down on your back and enjoy watching this great diplay. 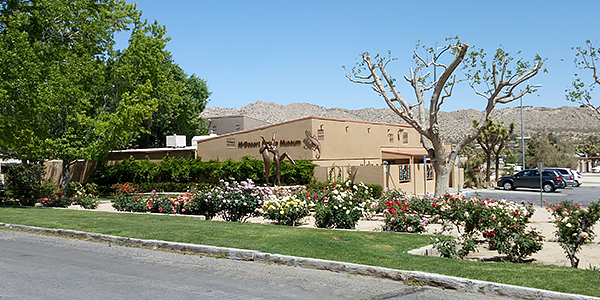 Founded in 1964 this museum focuses on sharing the natural history and the sensitive environment of the Mojave Desert, Morongo Basin and Yucca Valley, located next to The Yucca Valley Town Hall as well. This nice facility is located in Landers, California on your way to Giant Rock (largest free standing rock) or the Integratron a place, a dome for rejuvenation of ones sol, connect with the higher powers. 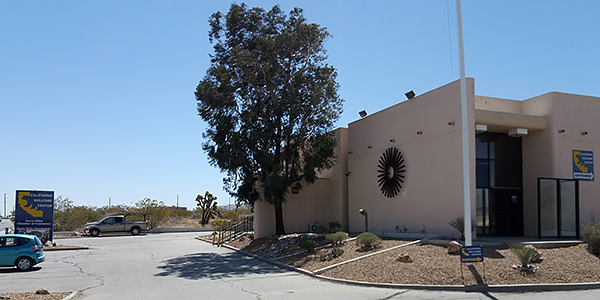 The museum is a passion of the locals of the Morongo Basin including us here at Active Atom. 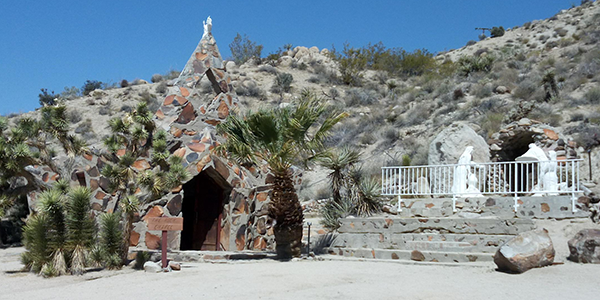 Religion is a big part of life in Yucca Valley. 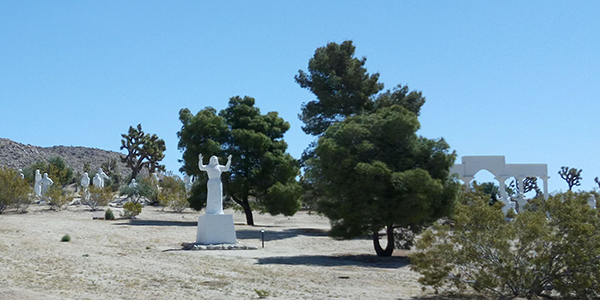 Situated on a hillside on 3.5 acres of desert natural land is the Desert Christ Sculpture Park by another great person who was like Lance and Patrick an aircraft worker Antone Martin. The park offers many religious sculptures fun for even the non religious to see these masterpieces in person. The first sculpture arrived and was dedicated on Easter Sunday 1951. There is a separate church located next door. 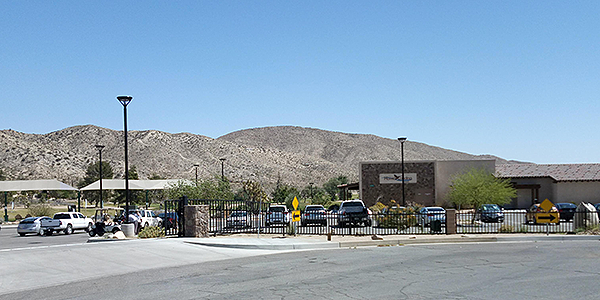 The church next door and nearly 20 more make up the wonderful churches of Yucca Valley. What we just discovered for the first time is a tiny little chapel built up against the rock mountain to the left of the Christ Park and this little chapel has some windows and two really strong wood doors. The chapel is made of cement and stone with a stone steeple on the top, it is a true sight to see. See and take a picture with our unique friends. 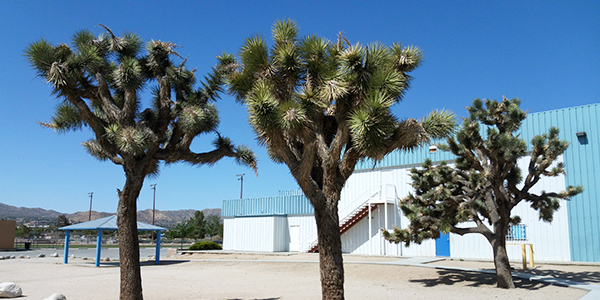 See a Joshua Tree, also named a Yucca Brevifolia, we just call them Joshua Trees and while they are rare to only four states, their common location is they only grow in the Mojave Desert in America. 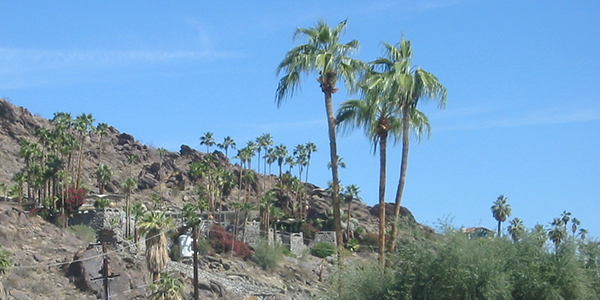 Yucca Valley is one of the locations Joshua Trees grow in. Yucca Valley, Joshua Tree’s are beautiful and yet mysterious, and yes they are plentiful in the Joshua Tree area and the Joshua Tree National Park to mention a few places they grow within. They are a government protected class of tree. Learn about the Joshua Trees you are about to see, they grow everywhere throughout both the hillsides and flat areas of the town. We have a few near our homes yard, though we do not have one on our property at Active Atom. We know there used to be two one in the rear of the house and one in the front, but they were gone before we got here. These wonderful trees grow and bloom beautiful green to white flowers though rarely, they do often enough though because we have seen it once personally since 2014. The Joshua Tree does not bloom unless it freezes in temperature. Despite a lack of water these trees have thousands of fiber like strands that bond making the hollow trucks as they do not have rings like a tree. The rout structure permits them to thrive as long as they are in a dry arid environment and at 1,300 feet to 5,900 feet in elevation. The Joshua Tree survives the arid desert and the common high winds by spreading their routs up to 36 feet outwards and underground they seek and find the minimal water necessary to thrive, this is some serious rout structures. The Joshua Tree grows to around 50 feet tall and half to equal in diameter, along the way they drop seedlings often and these seedlings grow rapidly, once the tree grows up and outward with unique shaped branches then those branches cause the tree to lean and lean too much causing it to loose the limb, limbs become a whole new life for beetles and lizards to thrive. The baby Joshua Tree is wonderful to see, straight perfect until they too begin growing limbs, blooming and creating new life. We also have Yucca Plants, Cactus, Cacti, a few various verities, Chaparral, Junipers. The high desert Yucca Valley does not have natural growing Palm Trees (that is a lower desert tree) though there are some people that planted them and they live here fine. Remember though there is a city in the far eastern end of Morongo Basin named Twentynine Palms, named such by early gold prospectors and miners and later a survey team sent out of Washington, D.C. discovered a water oasis in the area and counted the Palm Trees that are the Washingtonia Filifera verity, but only found 26 not 29, but to this day the name Twentynine Palms remains. This is a desert and there are many hills, mountains, washes, naturally weathered formations and places to explore and here is a link to many offerings about hiking in Yucca Valley California. The desert varnish coating is likely the oldest style of paint on natural surfaces because nature creates this phenomenon named Desert Varnish also known as Rock Rust or Desert Patina. The varnish color varies from brown to black, it may be orange brown and is about a micrometer in thickness and covers rocks that are located in arid dry climates, and as such this occurs in the Mojave Desert. The varnish is a compound of clay, iron and magnesium oxides. The varnish adheres through vast spans of geological time and is created through arid environments, high temperatures, wind, blowing dust particles, and light dew. The varnish attaches itself to larger rocks, mainly large rock formations, outcrops, etc. What you are in search of is not just the discovery of the Desert Varnish itself, this painted rock type is relatively easy to discover. What you are in search of is not yet discoveries of Petroglyphs carved into the varnished coating exposing lighter colored gray or lighter brown in the form of images or text scraped into the harder rock surfaces. These Petroglyths were most likely carved by Native Americans depicting spiritual images, animals, visitors and powerful leaders and alike. Located in the northwestern end of the Joshua Tree National Park it is a dead end location with hiking, RV areas, camping, horseback riding, view California Desert flowers, tortes observations and birding. We have the Black Rock Canyon Campground. We have the Black Rock Horse Camp. We have the Black Rock RV area. The Yucca RV Park as well in the downtown area on Route 62. This is a desert in fact being slightly cooler 10 to 20 degrees Fahrenheit then the lower desert, Coachella Valley area depending on the time of the four seasons. Yucca Valley and many other locations in the Mojave Desert are home to a lot of farming livestock and some agriculture. We have local horses, alpacas, cows, pigs, chickens, eggs, honey and we also have various vegetable growers. At local (one name) restaurants many serve these fresher meats, vegetables and ingredients as well as they are sold around town, at the Joshua Tree Certified Farmers Market (Saturdays 8:00 AM to 1:00 PM) and to local residents.